Big thanks to Juan and Anna for letting me stay with them on such short notice! 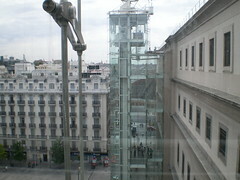 Their place was awesome and they live really close to the museums so going to the Reina Sofia was really easy. I saw Picasso’s Guernica. Art never seems to move me like I think it should. I was disappointed that I couldn’t take photos inside the museum, and there were workers all over the place, making sure people obeyed. I went out for my first beer and tapas with Juan and Anna and it was crazy how much food they gave you with your beer. We didn’t even have to eat dinner, and the beers were really cheap! Riding in the city was kind of crazy. 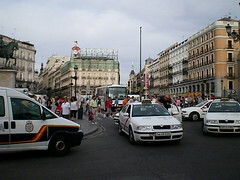 The avenues are so wide and traffic was not so heavy, so the cars could go really fast. It felt like highway riding in the middle of a city. Do they have avenues for bikers?